We can find a solution for your workplace! Application: HVAC Coil Handling to allow one operator to lift the coils and load onto the base unit without heavy lifting or awkward working postures. Problem: Customer was lifting heavy coils coming off a coil bender by hand. The parts weighed up to 90 pounds which required 2 operators to pick up the parts to load them onto the base of the HVAC unit. This required the operators to lift the heavy coil over their heads in order to set down the part. This application was a constant source of shoulder and back injuries. Solution: Using a pneumatically powered manipulator, we were able to grip the coil coming off the bender and lift them up, over, and back down onto the frame of the refrigeration unit. Because the coils were easily damaged, large gripper pads were utilized to in order to spread out the grip force. Because the part had to travel close to 30 inches in order to load onto the base, the coil lifter was equipped with two sets of controls. This allowed the operators to consistently maintain a good ergonomic position at pick up and set down. Result: We provided a custom pneumatic manipulator with pneumatically actuated grip to pick up HVAC coils weighing up to 90 pounds. 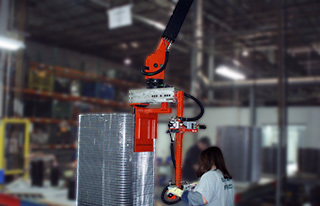 The handling manipulator has two sets of controls to consistently maintain good ergonomic posture. The customer was able to lift the part with one operator safely. The manipulator helped maintain task time, reduce injury, and free up an operator in the area to help out with other areas of production. 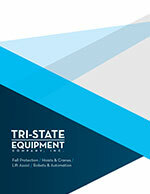 Contact Ergonomic Partners for assistance with your ergonomic applications. We solve problems! Ergonomic Partners serves clients from coast to coast, Canada, Mexico and especially focused in the states of Missouri, Illinois, Indiana, Kansas, Arkansas, Mississippi, Nebraska, Tennessee, Kentucky, Iowa, and Oklahoma.